The Moto G6 series is expected to launch in Sao Paulo, Brazil as Lenovo-owned Motorola readies to take the covers off its first new smartphones of 2018. Aimed at the mid-range, the upcoming series will consist of three smartphones — Moto G6, Moto G6 Play, and Moto G6 Plus — going by leaks and rumours. There have been official teasers and innumerable rumours regarding the three smartphones over the past few months, so we have a complete picture of the handsets. In fact, even the prices, images and key features of the Moto G6 series phones have been leaked in the last few weeks. We take a look at everything we know about the three smartphones ahead of the launch event tomorrow. Recently a massive leak revealed what the Moto G6, Moto G6 Plus, and Moto G6 Play will look like and revealed most of their specifications. The Moto G6 and Moto G6 Play prices were also tipped. As per the report, the Moto G6 Play will be priced at $199 (roughly Rs. 13,000), while the Moto G6 will be available at $249 (roughly Rs. 16,000). However, the pricing details of the other variant – the Moto G6 Plus – are not yet known. Also, there is no word on the India price of the three handsets either. 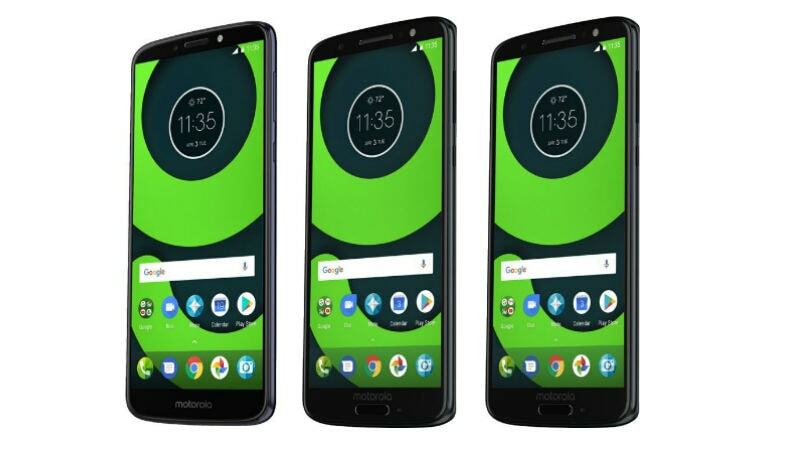 Thanks to the leaked images on a Hungarian site, we have a fair idea of the Moto G6, Moto G6 Plus, and Moto G6 Play’s design. While the Moto G6 is said to feature a 5.7-inch ‘Max Vision’ 18:9 full-HD display, along with “Attentive Display” support, the Moto G6 Play will come with a 5.7-inch HD display. Meanwhile, the Moto G6 Plus will come with a 5.93-inch full-HD display. Interestingly, the fingerprint scanner is at the front of the Moto G6 and Moto G6 Plus but at the rear end of the Moto G6 Play. Additionally, the phones are listed with 3.5mm headphone jacks and a Micro-USB port. Earlier, design renders of the Moto G6 were spotted on Chinese certification website TENAA. The renders have showcased a design that is reminiscent of last year’s Moto X4. It is seen to have a sleek metal frame with a camera bump on the back. Additionally, the dual camera setup is placed horizontally on the back. Also, the phone does not have a front-facing notch nor does it have a vertical camera module, unlike other Android OEM-branded phones flooding the market in 2018. According to a report last month, the Moto G6 Plus will be made available in Silver, Gold, White, Blue, and Cyan colour options. The report also stated that the phone will feature a metal and glass body with a curved back panel. While these design details had also surfaced in January and February, the latest listing confirms most of the features. In terms of specifications, the Moto G6 will be a dual-SIM smartphone running Android 8.0 Oreo. It will be powered by a 1.8GHz octa-core Snapdragon 450 processor and will come with 4GB of RAM. In terms of optics, the handset will sport a 12-megapixel rear camera with LED Flash and 5-megapixel secondary rear camera. On the front is a 16-megapixel camera. The inbuilt storage of the phone is 64GB internal storage, expandable via microSD (up to 128GB). Connectivity options include 4G VoLTE, WiFi 802.11 b/g/n, Bluetooth 4.2, GPS. It will be fuelled by a 3000mAh battery with Turbo charging. The Moto G6 Play is also a dual-SIM smartphone running Android 8.0 Oreo. It will feature a 1.4GHz octa-core 64-bit Snapdragon 430 (MSM8937) processor and come with 2GB of RAM. For capturing images, the handset sports a 12-megapixel rear camera and a 5-megapixel front camera. It has 16GB of inbuilt storage, expandable via microSD card (up to 256GB), and is powered by a 4000mAh battery. Coming to the Moto G6 Plus, it is also a dual-SIM smartphone running Android 8.0 Oreo. The big display handset is powered by a Qualcomm Snapdragon 630 SoC coupled with 6GB of RAM. It has 64GB of inbuilt storage that is expandable via microSD card (up to 256GB), and fuelled by a 3200mAh battery. As per earlier reports, the Moto G6 will come with a new ‘Cutout’ feature that will let users swap backgrounds in images. Also, users can apply “animated face filters”. Similar to the Google Lens, the Moto G6 will let users point the camera to an object to learn more about it. Additionally, there are several other camera features in the handset, such as beautification mode, active photos, best shot, and more.